increasingly troubled at the inconsistencies in the official narrative of 9/11. Judging from the reaction in some parts of the blogosphere, he's gone quite mad! Fisk is free to spout out far left wing conspiracy theories and the Independent is free to print them, but given Fisk's previous lies, one has to wonder why the Independent continues to embarass themselves. Oh, that's right, they're not embarassed. Silly me. Of course, he denies being a crackpot while recycling all of the crackpot questions. Unfortunately, Curley doesn't make any attempt to explain what's "crackpot" about the questions Fisk asks, or why asking these questions makes him a "crackpot". 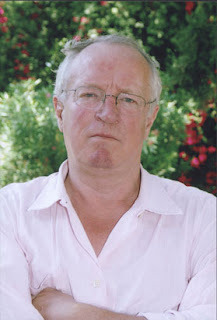 Robert Fisk is perhaps one the best known foreign correspondents covering the Middle East. He has covered everything from the Iranian Revolution to Lebanon to the current war in Iraq and has won multiple awards and honorary degrees for his coverage. He has even interviewed the head-lopping islamo-fascist devil Osama bin Laden on multiple occasions. He has apparently lost his marbles in his latest ravings questioning the official story on 9/11. Descend with me below the fold into the madness. What a stark-raving lunatic! Madness! Madness! Madness! I am glad that we in the reality-based community do not associate ourselves with fringe journamalists like Robert Fisk. All those people who gave him degrees and awards must be feeling pretty foolish now. Ad hominem, ad hominem, ad nauseam. But again, no attempt to answer any of the questions. Does Allahpundit at Hot Air give us any answers? Nope. Just a big quote, as if Fisk's words disproved themselves! Robert Fisk - Moonbat At Large! No, seriously! This moonbat is at large! Wandering around, bumping into things, drooling on his keyboard and possibly crapping his nappies! Lunatic?? Islamic terrorists kill three thousand of our citizens in an unproved attack on us for who we are, and Robert Fisk thinks that it’s “lunatic” to defend ourselves or strike back against those who attacked us and would gladly attack us again. Two guesses who the “lunatic” is in this scenario! He says, I am not a conspiracy theorist, then regurgitates the same old conspiratorial crap the rest of the moonbats do. Where has Fisk gone wrong? Aside from the fact that Fisk himself is a nutter, a moonbat, wandering around, bumping into things, drooling on his keyboard and possibly crapping his nappies, what has any of this taught us? Nothing. Where did Fisk go wrong? I could quibble over minor issues but instead I will focus on the three points that seem most significant to me. 1] Fisk says the towers "collapsed". But they didn't. The towers disintegrated. If they had collapsed we would have seen huge slabs of concrete and long twisted steel columns. Instead we saw a huge cloud of dust -- and the structural steel was all broken apart. The central columns weren't left standing, nor did they fall over. "Collapse" means to fall down, or fall apart. The towers didn't fall apart except in the molecular sense of the word. Knowing what happened to the towers may be the key to the entire mystery; the first step on the path to this knowledge is the realization that the towers didn't collapse at all. Any military which can claim – as the Americans did two days ago – that al-Qa'ida is on the run is not capable of carrying out anything on the scale of 9/11. The absence of logic here is overwhelming: because the American military tells little lies, that means it's not capable of telling a big one! Surely the ability to lie with a straight face is never a reliable indicator of innocence. My final argument – a clincher, in my view – is that the Bush administration has screwed up everything – militarily, politically diplomatically – it has tried to do in the Middle East; so how on earth could it successfully bring off the international crimes against humanity in the United States on 11 September 2001? Here Fisk shows a fundamental lack of understanding. He mistakes the difference between Bush administration's words and deeds as incompetence. Unfortunately for him -- unfortunately for all of us -- the Bush administration has been running two different agendas ever since it took office: there's a public agenda (they say they're trying to make America safer while bringing democracy and stability to the Middle East) and there's a private agenda (seeking to control key parts of the Middle East, build bases there and exploit the natural resources, while sacrificing America's safety in the process). This may be Fisk's final argument, but it's by no means a clincher. If the United States truly wanted to provide security to Iraq, they wouldn't be fomenting "sectarian violence" and arming all sides. This is what you do if you're trying to accelerate a civil war. The realities on the ground in Iraq are entirely out of synch with all the alleged justifications for this war, and the war now stands exposed as exactly what its opponents have always said it was -- mass murder and grand theft, a premeditated war crime of unimaginable scope and ferocity. There' s truth, and there's politics, and never the twain shall meet, as they say. In all American administrations there have been significant differences between what they've said and what they've done. The remarkable thing about this administration is that their public pronouncements are so completely at odds with their actions. Quite often what they say is not only different from the truth, it's the exact opposite! But of course! Of course they have to lie about what they're doing: their agenda is so evil that if they spoke of it openly, nobody -- not even the fools I have quoted above -- would support them. I don't expect Robert Fisk to understand any of this, because he despises the internet, which just happens to be the only place such a frank analysis can be found. On the other hand, many other journalists who use the internet quite well are several steps behind Fisk on this issue. In any case, if he can ever bring himself to think clearly about these three crucial points, Robert Fisk might someday begin to understand what happened on 9/11. And that would be a very good thing, because at the moment he sounds like a nutter. Bush Hates America: Iraqi Weapons Caches Are Still Open!